Whether it’s a pop-fly or a base hit, your fans want to watch their favorite players hustle! Make sure they know the details when you print Baseball Stitches Posters to advertise your event. 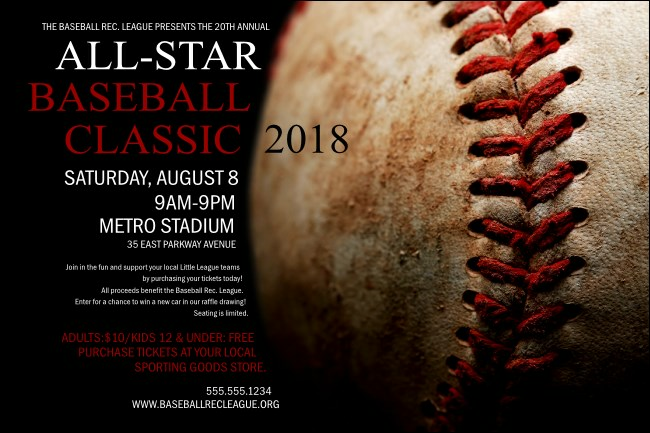 With over fifteen lines of text on a black background and a baseball with bright red stitching up front, these Poster templates are a line drive to great ticket sales. Wait! There’s more! Check out all our sports-themed Event Kits at TicketPrinting.com.